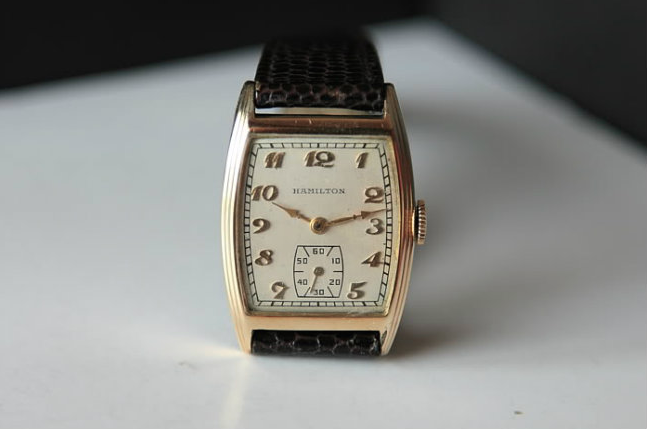 After Hamilton's first run of "geometric" wrist watches (the Square, the Barrel, the Rectangular, etc) many of the models began to take on men's names. This was a common practice up until the 1950's, when marketing introduced other model names related to the automatics and electrics. The electrics got "cool names" like "Everest" and "Altair" and the automatics got rather dull names, like K-401. I think maybe the creative types ran out of inspiration eventually. They repeated some names more than twice. For example, Perry. But somehow they missed Daniel, David, or even William. One of the first men's named watches was the 1932 Webster. I like to think that it's a Daniel watch (Daniel Webster) and I also like the Boone for the same reason. The Webster came in a 14K gold filled case in either yellow or white gold and with three dial choices... applied gold numerals, luminous figures and hands or black enamel. The Webster uses the 6/0 size, 17 jewel 987F movement as standard issue. However, in 1933 it was one of several gold filled models that received the 19 jewel 979F movement. In 1934 it reverted to the 987F movement. Early models use female spring bars while later models use male spring bars. So if you have a case with holes in the lugs it's likely a later model. The Webster was produced through 1935. The Webster is very similar to the Glenn Curtiss - which was a solid gold model from the same time period. The two models share the same crystals and dials but being solid gold and made in the height of the Great Depression, the Glenn Curtiss is much more rare and, of course, valuable. As far as the Webster goes, it's fairly easy to find with the AGN dial. Models with the enamel dial and the luminous dial are more rare and usually draw a premium. I like the Webster - it's a good sized watch, especially for this time period. Hamilton had not introduced it's smaller 14/0 and 8/0 movements yet. I think the Webster looks great on the wrist and is an excellent dress watch. I like the black enamel dials - but who doesn't? This one is a great original example. 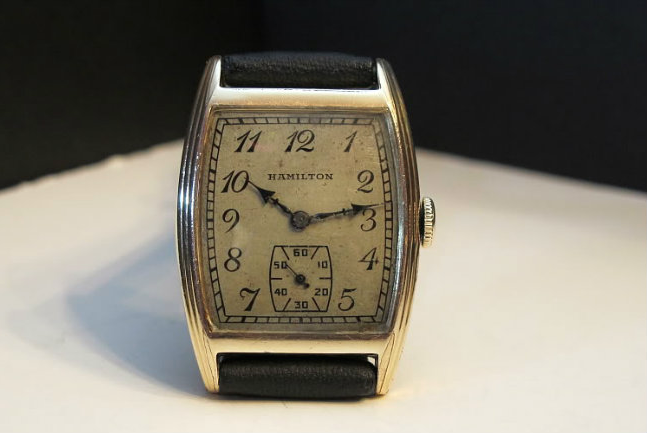 Hi, i am trying to find out more information on my 1932 hamilton webster. It is a solid 14k white gold presentation watch from Packard motor company for 10 years service. I cannot seem to find anything on it. If you have any info that would be great! 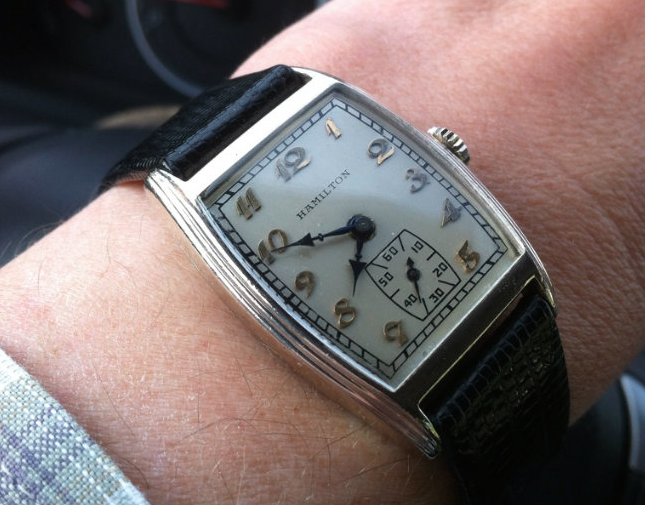 Looking at the production records, Hamilton made 97 special Packard Websters in 1932 in solid 14K white gold. So it's a legitimate and very rare watch. I am looking to sell it. Any idea on a value? It is in perfect near perfect condition. I have one of these watches and it still works! It's a 987 Webster 14k Gold Filled Dial #062 LUM. However, I can't understand why the acrylic or crystal is clear green! Why? Has it just aged that way? I believe my grandfather had the original band replaced with a flexible gold one. It's been stowed away for 20 years. I have the original box and case #0660223. Any ideas about the green aperture?